Welcoming the Stranger: When there was no room at the inn, a makeshift place became the holiest of holy ground for one little family, far from home. Finding holy ground: that is what we do together every week, through God’s grace, at our Boarding Homes Ministry (BHM) visits. Mary and Joseph, like many before them, were strangers in a strange land when Jesus was born. There’s a reason why the principle of welcoming the stranger is such a constant refrain in the Bible. (It’s the most invoked principle in the five books of Moses). The longing for connection is our deepest spiritual need. It is one and the same as our longing for God. What the Bible reminds us is that through the practice of community we have the opportunity, and the responsibility, to channel God’s love for one another. When we do this, we unveil the holy ground on which we stand. This is the Boarding Homes Ministry model: teams of faithful lay visitors and myself, a multifaith chaplain, visit the residents of local boarding houses. We are guests, allowed to visit by the home owners. Usually, the people who visit boarding homes are either local friends or health professionals such as nurses and social workers checking up on people, giving injections and conducting assessments. BHM teams, by contrast, are there to be an “agenda-free presence”: no assessments, no treatment, no fixing. As guests, we are there simply to appreciate our wonderful neighbours. We notice. We listen to stories. We recognize each individual’s gifts. We receive each other. When a person is new to the house they might approach our visits tentatively. Some are new to the country, while others are visiting us from “strange lands” that are not so far: in prison for the last few years, or living in the “strange land” of mental illness, with a different way of seeing the world. Experiences like paranoia and trauma can make it hard for people to approach us. It’s not easy to trust a new group of people, especially when the class difference can be obvious. Who are these volunteers? What’s their agenda? The fear accompanying people can be palpable. The only way to prove the absence of an agenda is to keep showing up. A team’s steady, faithful presence allows opportunities for residents to slowly let their guard down. That steadfastness is a spiritual practice on our part, one that quietly conveys God’s steadfast love that accompanies us. There is, of course, a single, largely unspoken agenda. To experience God’s steadfast love, together. Conscious of the welcome we receive in their home, one way we show that we return the welcome is through food. We might not have an opening or the right words to say to them, “God’s love for you is abundant”, but we can say it with treats. A few times a year we have feasts: a barbecue in the summer where residents can have seconds, thirds, and fourths (God’s love is abundant! ), and, of course, Christmas dinners. On a regular visit, a new resident’s eyes might open wide seeing butter tarts, taking one and slipping away to their room. Sometimes it is months before the trust is built and we begin to hear that person’s story. Sometimes those months will give us the gift of that person’s sustained presence: no words, but enough comfort with us that they can stay in the room for the whole visit. We want to be with them. They want to be with us. God has chosen us for one another. Grace abounds. Some teams bring music of one kind or another. One resident said of a team member: “I like that he plays his banjo. I like that I can ask him questions about the Bible. And I like that he is kind and compassionate, not like my dad”. As we become not-so-strange to each other, wounds and vulnerability begin to show. These are held with reverence. Some people’s stories are shocking, many are heartbreaking. Staying with the person’s story can take a lot of focus and equanimity on the part of team members (and often a thoughtful debrief afterward, as well as regular workshops and training). One crucial ingredient in our welcome, therefore, is acceptance. To remain steadfast in caring companionship, to receive vulnerable people with reverence and care, is one of the greatest gifts we can give. The surprising part for many of our team members early on in building these relationships is how much they themselves receive. Over time, we all learn that we aren’t bestowing God’s steadfastness and compassion. We’re participating in it. And as we participate, we also receive. Coming to a visit with a burden or a question on the heart, we often leave with a feeling of lightness or resolution. Something truly transformative happens in those spaces. The Spirit is manifestly at work. In our gathering, we uncover the welcome at the heart of things. writes St. Augustine. In the inner city, the stigma and affliction of poverty, mental illness, and addiction can add layers and layers of isolation around people’s souls. The miracle that unfolds in our boarding home visits is that when we open our hearts to each other, grace comes pouring in. “I was a stranger, and you welcomed me”. Loneliness makes space for love. Through welcome, we delight in one another. We are more ourselves, more God’s children, when we come together. 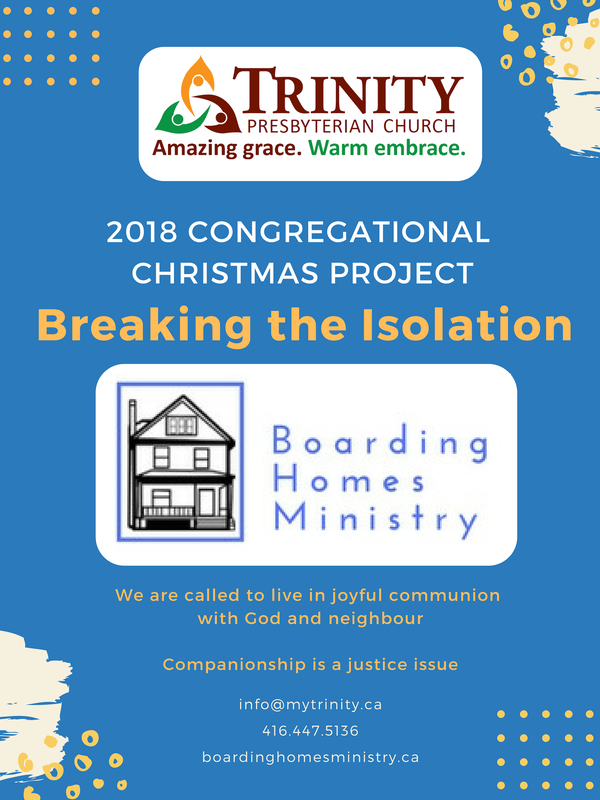 Donations for our 2019 Congregational Mission Project can be made by using, your offering or visitor’s envelope: please write ‘Boarding Homes Ministry’ on it. Gifts given directly to Boarding Homes will be credited to our project. We ensure that you will receive a tax receipt. ​We can also give by click the button 'Donate Now' below. Please feel free to contact the church office at 416.447.5136 or email us at info@mytrinity.ca with any inquiries.